Strength training has long been an important component of runners’ training. Iconic coach, Percy Cerutty, strongly advocated the importance of bounding and powering up the Portsea sand hills in order to prime his athletes for faster track or road running. Similarly, Arthur Lydiard believed that his athletes should only embark on fast track interval training once they had developed their strength on the hills. 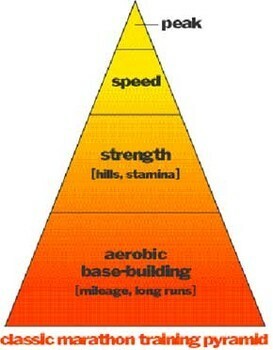 Hills should form an important part of the training structure. During the aerobic phase hills should be plentiful and incorporated into most training runs. Then, before entering the degrading anaerobic training phase, a block of more focused hill intervals should be conducted. This can include hill intervals, hill bounding and downhill strides to prime the running muscles for higher speed training. The other benefit of training on the hills is that is quickly enhances a runner’s economy and technique. Within each phase of the training structure it is important to progressively load the body before resting. This process of overreaching then recovery ensures that adaptation occurs. I liken this process to a wave. 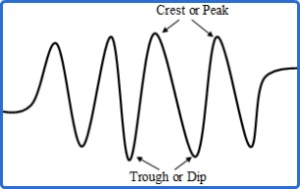 Each week the volume or intensity of the wave increases until the most sustainable peak of training is reached, after which rest and recovery is required to rebuild the body for the next wave. Starting a training week with an achievable volume and intensity is important. Comprise this week of training sessions that you know you can achieve. They may not be easy, but prior experience tells you that you can handle this load of training. In the next week, stretch yourself a little, knowing that in the coming week you will be returning to a recovery level. This three-week periodised approach will help to prevent overuse niggles and injuries from setting in. Day-to-day, training load should occur in ebs and flows. Easy days are required to prepare the body to train. They should involve activities that gently prime the muscles, removing waste toxins and tightness generated from prior hard training. Non-weight bearing training is excellent on easy days. A moderate day with higher volume should follow your easy days. These moderate days can help to clock up the mileage but should be kept to lower intensity training zones. A classic example of a moderate day is a mid-week longer run. The highlights of any training week are the harder days and these should only be conducted once the body has been primed by its easier and moderate days. Harder days either involve high intensity training or longer volume runs. Thus, training is conducted through a wave of training from easy to moderate to hard. An example of this wave theory is shown below. Like I discussed earlier, the ‘old school’ training planner often prescribed training without highlighting this underlying structure. Therefore, athletes were often shifted off course if life threw them a curve ball. For example, it is easy to head out with a friend for a so-called ‘Recovery Run’, only to find yourselves overcome by the joy of running and galloping around at great speed. So, under our old training plan, it would be easy to shrug this off and back up the next day with the next prescribed harder session. The problem is that you are now risking injury because your body has not had a chance to repair. Instead, having a training structure suggests to the athlete that ‘this is your hard day and this is your easy day’ with hard equaling easy. That is, for every amount of hard training you do, you need the same amount of easy. If two hard training days fall together, you are now looking at two easy days for the body to fully recover. Finally, running is sport. It is what we do for health, recreation and enjoyment. If one establishes an inflexible training plan that prescribes every day as if it has been drawn in concrete, then we can quickly reach a point of athlete burnout. Here I would encourage you to step out into the wild. By all means plan out your important sessions and longer runs. But leave the rest to feel and a love of exercising. Avoid over-prescribing your easy days so that you can listen to what your body is telling you. Do not be tempted to squeeze in those extra sessions under the pretenses that you should. Rather, find your feet with a smart training structure, ability to listen to your instincts and a love of exploration.